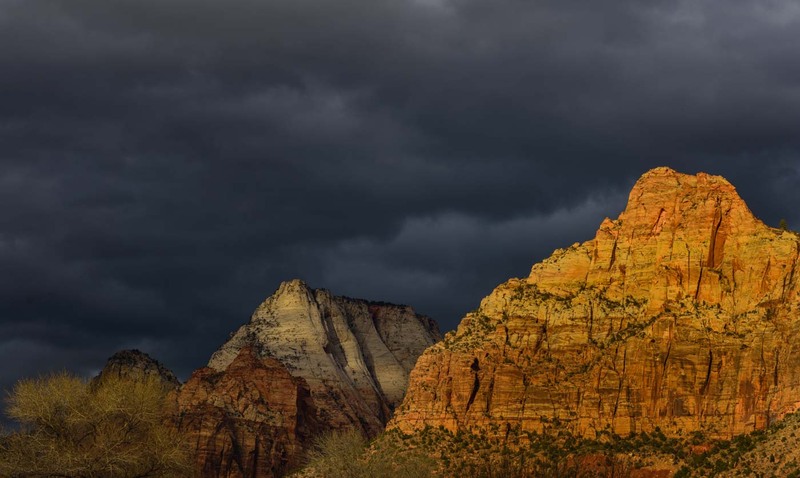 I love the contrast of the sun illuminating Watchman Tower against the dark storm clouds. I spent most of my first day in the park dodging thunderstorms. However, as evening approached the clouds cleared in the west setting up the conditions that generated this image. For all its beauty and grand scale, Zion is a difficult place to photograph. Grand vistas are difficult to find and compose, but for those with an eye for intimate landscapes and reflected light will find an abundance of compositions in Zion. Nikon D800, 80-200mm, F8, 1/250 sec, ISO 100.